Casa Ventana Puerto Vallarta – its reputation precedes it. The vast majority of their guests are returning guests or referrals from former guests and we believe this says a lot about not only the quality of the accommodation and services they offer, but also overall value for money. 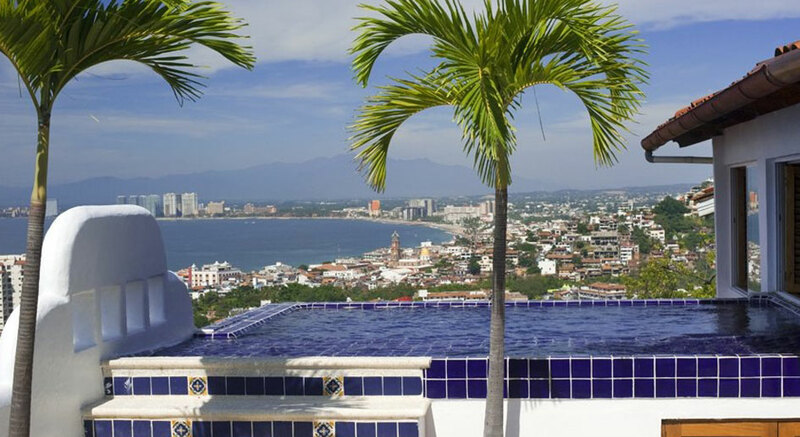 This hideaway on the Mexican Riviera features a private infinity plunge pool overlooking Puerto Vallarta’s historic Old Town with panoramic and unobstructed Pacific Ocean views. Casa Ventana is a 3,500 sq/ft luxury executive penthouse, and comprises the top two floors of an intimate and small condominium block of only six units and is suitable for up to six guests. Perfect for small families, groups of friends, or a single couple looking for romance and privacy. While staying at Casa Ventana you will be pampered by Lette, the house manager, who is also a fully qualified masseuse and beauty therapist. On arrival, Lette will prepare complimentary welcome margaritas to accompany homemade tortillas, salsa, and guacamole.Please feel free to make arrangements with Lette to shop for groceries, prepare exquisite and authentic gourmet Mexican meals, or book a massage or facial treatment. (Please note: meal preparation and spa treatments are an additional charge). On the first floor of Casa Ventana, bi-fold glass doors fold away onto the deck that wraps around the living and dining room area, and boasts a fully equipped gourmet stainless steel and granite kitchen, two master bedrooms each with private baths, guest bathroom, laundry room and more. On the top floor of Casa Ventana you will find a spacious conterra stone tiled sunning deck with lush tropical gardens, and your very own private infinity plunge pool. This level also has a bar, studio size master bedroom with cathedral ceilings and entertainment center, marble bathroom, and a covered living room with built in furniture that opens onto the deck and ocean views. If it is just a lazy day you are after, stay home and watch cable TV channels, maybe read one of our hundreds of books, or just sit back and enjoy a view that will take your breath away. Casa Ventana is truly a unique property – perfect location, unsurpassed views, luxurious appointments, all amenities, and outstanding service with a personal touch. Casa Ventana is pleased to offer their guests a range of professional in house massage and French Guinot facial therapies to help you unwind and wash away the stress of the “Real World.” Lette is a licensed beauty and massage therapist from the Shianti Institiute of Beauty Therapy in Puerta Vallarta and has also received intensive training in Guinot Institut.Spa products and therapies during her internship at Qamea Resort & Spa in Fiji. Guinot is widely recognized as the “Rolls Royce” of spa products and therapies, and is offered only in the most exclusive spas worldwide. Guinot combines specialized facial techniques and ingredients carefully selected by expert international beauticians and designed to deliver excellent facial results. For massage therapies, we import a range of Fijian massage oils made from cold pressed virgin coconut oil. Additional inclusions, meal and beverage packages may be available for your dates of travel. Contact Remarkable Honeymoons for Casa Ventana’s current rates and specials! The famous Gringo Gulch area downtown is quite picturesque with winding cobblestone streets and unique old world charm. The exclusive neighborhood was named for the influx of North Americans that invaded the narrow river road and created an artistic and happening scene after the wild publicity generated from the filming of Night of the Iguana in 1963. Elizabeth Taylor and Richard Burton owned a vacation home in this area until his death in 1984, called Casa Kimberley. It has been kept intact by the new owners, tours are available. Los Muertos Beach is the most popular beach and the center of daytime activity, also a favorite for sunset. A place where tourists and locals effortlessly mix, it is the top gathering spot for all ages and features some of the best restaurants in town, several with beautiful palapas situated right on the sand, 20 feet from the water. Los Muertos is what makes Vallarta unique from most Mexican resorts. You can sunbathe and swim in a public area while waiters bring you food and drink. Los Muertos also has all kinds of water sports for rent: wave runners, parasailing, banana boats, fishing charters etc. The Water Taxi leaves Los Muertos pier every morning at 10 am for the beautiful beaches on the south part of they bay only accessible by boat. We highly recommend visiting Las Animas, Quimixto and especially the bohemian paradise of Yelapa. You can also take the water taxi from Boca de Tomatlan, the last cove on Banderas Bay accessible by car or bus. Seeing the bay from the water is a must and a water taxi ride to Yelapa is one of the easiest and least expensive ways to do it.